Goodall Homes hosted a Realtor Focus Group at our StoneBridge community on Wednesday, April 4th. Realtors had an opportunity to tour our Single Family, Villa, and Townhome Models. Over lunch, Realtors and the Goodall team brainstormed on how StoneBridge can be the first new home community that comes to their minds when they have buyers looking to purchase in the Lebanon or Mt. Juliet areas. 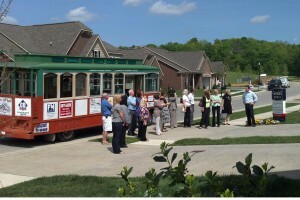 A trolley took the participants from one Model Home to the next, and a great time was had by all! Thanks to those realtors who took part in helping Goodall continue to be the best of the best in Middle-Tennessee!